KYOCERA Net Manager is equipped with functions that provide complete control of print services within any size corporation. With KYOCERA Net Manager’s ability to set user policies and manage print devices, your business can become a true cost control center. Administrators can securely leverage where and how employees print (even on-the-go users); with an easy to use Interface. KNM’s robust reporting makes these tasks seamless and accurate, including accounting and assessing of all document output activities concerning scanning and printing. An administrator can decide how many MFPs are needed based on their usage, which helps with site survey designs and proposals. KNM can also capture hard documents, securely, digitizing them for storage and/or distribution. Print Jobs may be tracked via print driver, USB stick, EFI Fiery, Cloud, and Send to Me. Offline Authentication allows continued printing if the server goes down and reconciles accounting data and reports, when the server is recovered. With KNM, quotas and credits can be assigned to mobile and non-mobile device users alike. KYOCERA Net Manager, in its entirety, has virtually everything an administrator or IT Project Manager desires to be seamlessly affective when managing costs associated with document output. 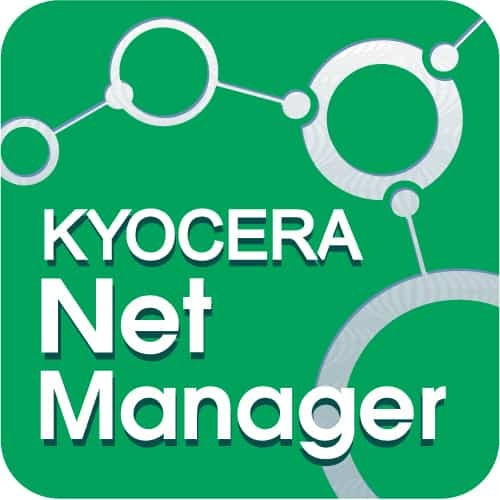 To learn more about Kyocera Net Manager and other KYOCERA Business Applications.